With all the controversy we have surrounding Columbus Day, who knows, they might decide to abolish it after this year. With that in mind, I can’t think of a better time to share this fine swing record, and you’ll see why. Though this was recorded near the beginning of the swing era, recordings like this represent swing’s finest, or at least jazziest period, in my opinion. Joe Haymes got his start in the music industry as arranger for Ted Weems’ orchestra before breaking out with his own band in 1930. Eventually developing a reputation for doing so, Haymes sold off his first band to movie star and musician Charles “Buddy” Rogers in 1933. He put together another band the next year which was taken over by Tommy Dorsey after the famous Dorsey Brothers split. Afterwards, he organized yet another band to record with the American Record Corporation, which is heard on this record. Perfect 6-05-09 was recorded on March 11, 1936 in New York and features the talent of Cliff Weston, Zeke Zarchy, and Gordon Griffin on trumpets, Mike Michaels and Frank Llewellyn on trombone, Leo White on clarinet, Edgar Sarason on alto sax, Freddy Fallensby on tenor sax, Ben Herrod on baritone sax, Bill Miller on piano, Brick Fleagle on guitar, Jack Fay on string bass, and Charlie Bush on drums. First, Haymes’ orchestra plays Leon “Chu” Berry and Andy Razaf’s composition, Christopher Columbus (A Rhythm Cocktail). You may recognize this tune from Benny Goodman’s famous performance of “Sing, Sing, Sing”, which featured the theme along with Louis Prima’s famous composition. 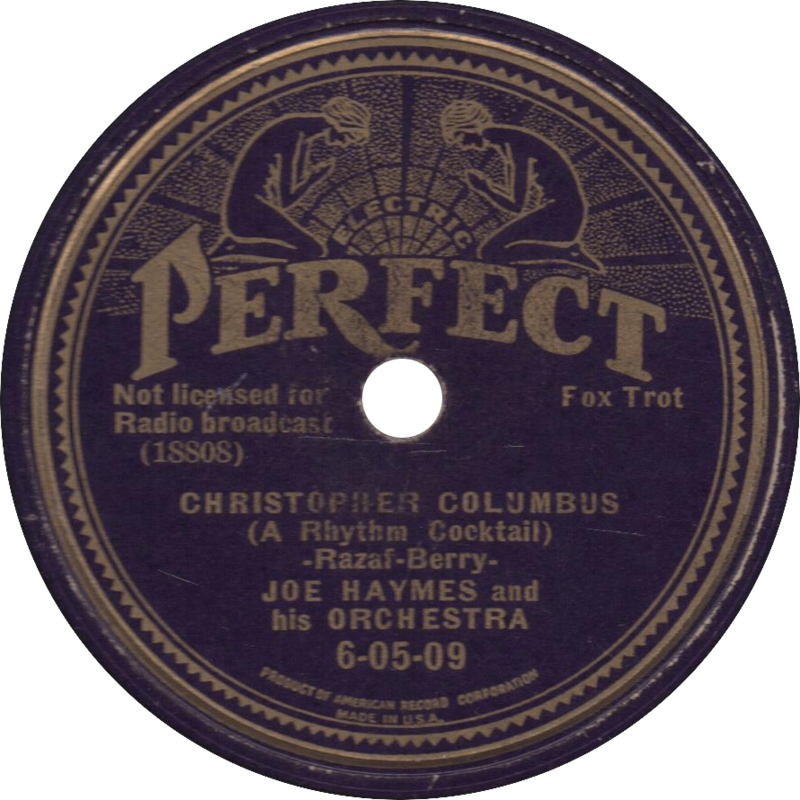 Christopher Columbus (A Rhythm Cocktail), recorded March 11, 1936 by Joe Haymes and his Orchestra. On the flip, they play Stuff Smith’s “I’se a Muggin'”, with a vocal chorus by trumpeter Cliff Weston. I can’t figure out what the heck is going on in these lyrics. 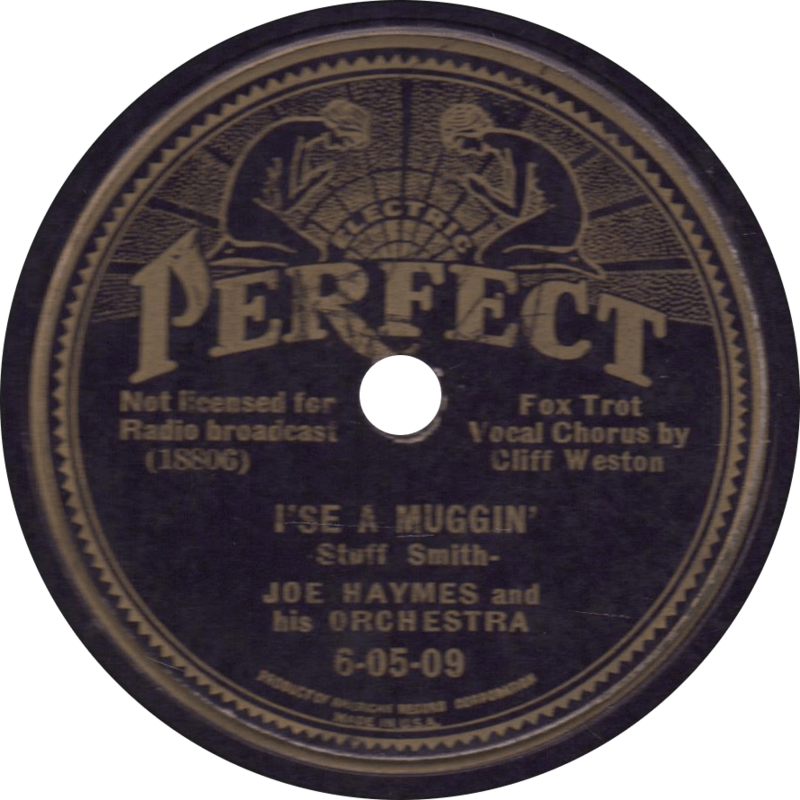 I’se a Muggin’, recorded March 11, 1936 by Joe Haymes and his Orchestra.